It could have launched Apollo 18, but it never got off the ground. Still, the Saturn V rocket on display at NASA's Johnson Space Center has long outlived its sisters that took men to the moon between 1969 and 1972. Now the Smithsonian's National Air and Space Museum has begun preservation efforts on the 363-foot launch vehicle, which should add many more years to the rocket's life. The Saturn V, from the command module's escape tower to the nozzles of the five first-stage engines, has been on display outdoors at Johnson Space Center in Houston since 1977.� It formally became part of the Smithsonian collection in 1978 but remained at the Houston location. The Saturn V needs attention: some external surfaces have broken down and corrosion has affected internal and external structures. Growth of mold and plants indicates excessive moisture and poor drainage throughout the rocket, while small animals have found shelter inside and are responsible for acidic debris and damage. A grant from the Save America's Treasures program of the National Park Service and the National Trust for Historic Preservation could provide $1.25 million for the project.� More than half the required dollar-for-dollar matching funds have been raised from the private sector. Allan Needell, curator of the Air and Space Museum's Apollo collection, is hopeful that additional donations will allow the Smithsonian to make full use of the Save America's Treasures Grant. The Smithsonian has contracted with Conservation Solutions Inc. (CSI), of Washington, D.C., for initial steps in preservation:� thoroughly cleaning all rocket stages; removing fluids from tanks and lines; proposing and testing state-of-the art techniques for corrosion removal; surface preparation and repainting; and starting work to repair damaged components. The initial work has already begun. CSI also will provide a temporary temperature- and humidity-controlled building to protect the Saturn V during the preservation work and until a permanent indoor display site can be provided. 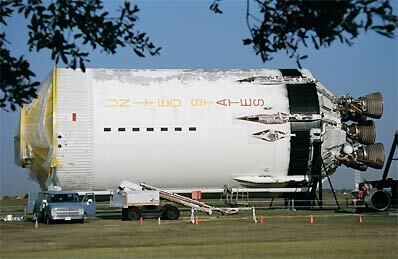 Ultimately the goal is to save the Saturn V and to restore it as closely as possible to its original appearance. The Saturn V was first used to carry humans during the Apollo 8 mission orbiting the moon in 1968. Saturn Vs were used for all lunar landing missions and in carrying Skylab into orbit in 1973. Of the three surviving Saturn V launch vehicles, only the spacecraft at JSC is made entirely of rocket stages intended for flight. Three planned moon flights, Apollo 18, 19 and 20, were canceled. Smithsonian curators, conservators and advisors, with the help of NASA, have been working to create a comprehensive plan to preserve and protect the Saturn V at the Johnson Space Center for future generations. So far they have raised sufficient funds to complete the first phase of the preservation efforts. If the remaining matching funds can be raised, the job is scheduled for completion in December of this year. The National Air and Space Museum building on the National Mall in Washington, D.C., is located at Sixth Street and Independence Avenue S.W. The museum's Steven F. Udvar-Hazy Center is located in Chantilly, Va., near Washington Dulles International Airport. Both facilities are open daily from 10 a.m. until 5:30 p.m. (Closed December 25.). Admission is free but there is a $12 fee for parking at the Udvar-Hazy Center. Shuttle bus service runs between the facilities with a roundtrip ticket costing $7 (group discounts are available).